Y'know you picked the right one when you've been married nearly 20 years (next Feb) and he still does things like come home after working really late in the office in London, on nearly the last train, because he knows you haven't been sleeping well. Even though he had the option to stay up there and it would have been much easier for him. He's such a sweetie. He knows I rarely get any sleep when he's not there, so he came all the way back. And it worked, I did get some sleep last night. Took me a while to fall asleep, but once I did I slept right through - a nigh on miracle at the moment. The heat and me are not friends. And sometimes my brain decides to join in just for fun and keep throwing things at me - not even bad things, just stuff. 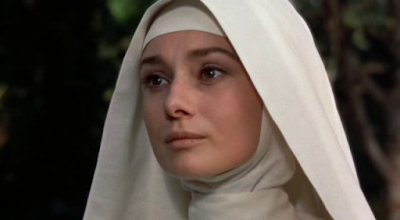 I watched A Nun's Story last night while waiting for Rob to come home. It always makes me cry in places and it was just the gentle story telling that I needed to help turn my brain off before bed. Audrey Hepburn really was a remarkable actress. Finished a whole new chapter of my alpha draft of my novel yesterday. It was needed to plug 2 "but why..?" moments that Rob picked up for me when he read it through. So now version 2 has gone out to my alpha readers. Didn't think it was going to need a whole chapter when I started writing, but it seems the holes were bigger than I thought ;) Rob's a great alpha reader because he doesn't think remotely in the same way I do, so missing bits are glaringly obvious to him. He's also good at spotting the odd typo. This entry was originally posted at http://beren-writes.dreamwidth.org/349813.html.